The smoke makes for a pretty sunset. The pink glow of the sun tells us that there is a fire burning someplace nearby. Unfortunately it is a sight that is happening too often here in Santa Barbara as wildfires become a year-round phenomena. When it affects your home, SERVPRO of Santa Barbara is here to help! Well if there WAS snow in Santa Barbara, that would not deter us from our job either. In the meanwhile, we do not let ANY of the elements that we DO have here in town prevent us from doing our job. 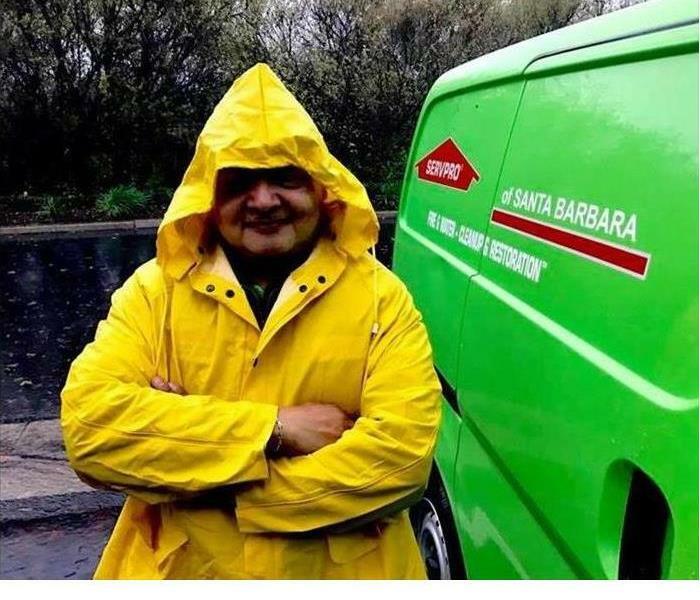 The technicians from SERVPRO of Santa Barbara go out in whatever weather is presented to us and we welcome the opportunity to help you! There are many different companies out there offering restoration services. 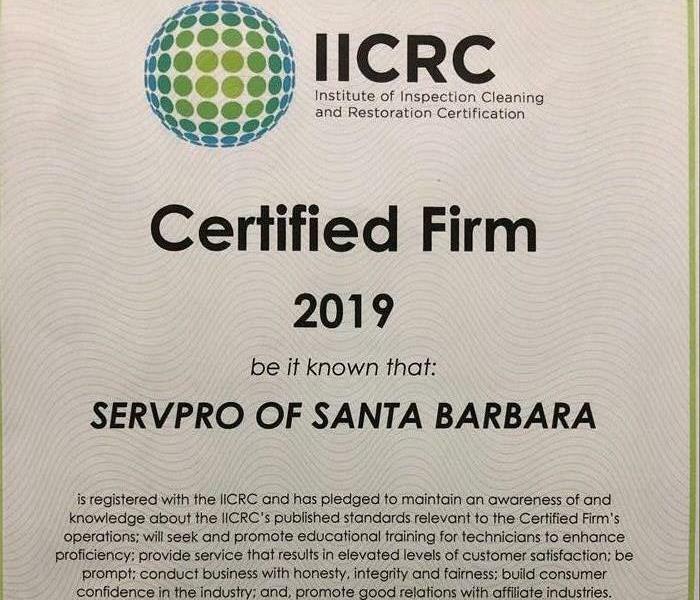 One of the many reasons why you would select SERVPRO of Santa Barbara is because we have Institute of Inspection, Cleaning and Restoration Certification. This means our technicians set themselves a part through training, experience and comprehensive examination — IICRC certification helps to immediately identify the cleaning, restoration and inspection industry’s most skilled and dedicated technicians and businesses. 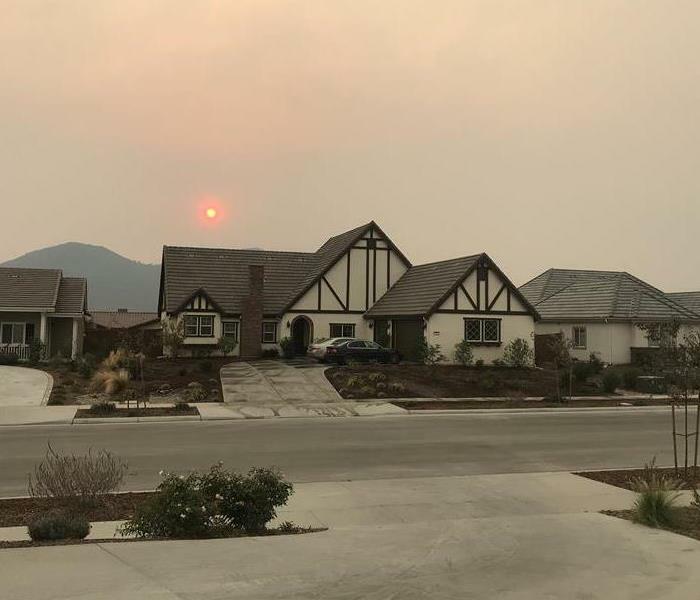 Recently, SERVPRO of Santa Barbara has been helping out with fire losses resulting from the Woolsey Fire. One of the great things about SERVPRO is that even though we are a local company, we are able to draw on nationwide resources. There is never a job of any size that we are not able to scale up to and handle for you. 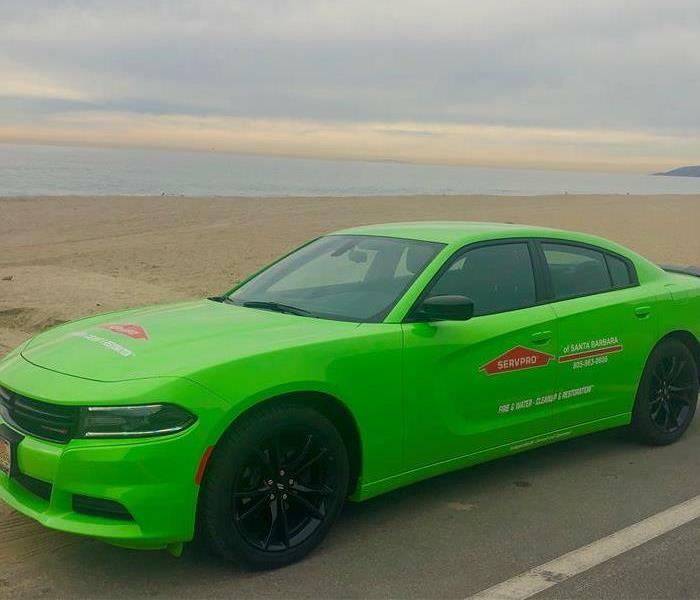 SERVPRO of Santa Barbara is very proud of our latest acquisition...a 2018 Dodge Charger. We actually use GPS tracking in all of our vehicles so the driver of this vehicle won't really be speeding but this car sure looks like it is faster to any disaster! Recently, SERVPRO of Santa Barbara had the privilege of helping some of the victims of Hurricane Florence. SERVPRO is a national franchise and when the call goes out for help, franchises from across the country respond. We ended up sending three crews to North Carolina and were able to see the devastation first-hand. We were glad to be able to make a difference for those affected. We are also grateful that hurricanes do not come to California. SERVPRO knows how difficult business is under normal circumstances but when water or fire are added to the mix it can be almost impossible! 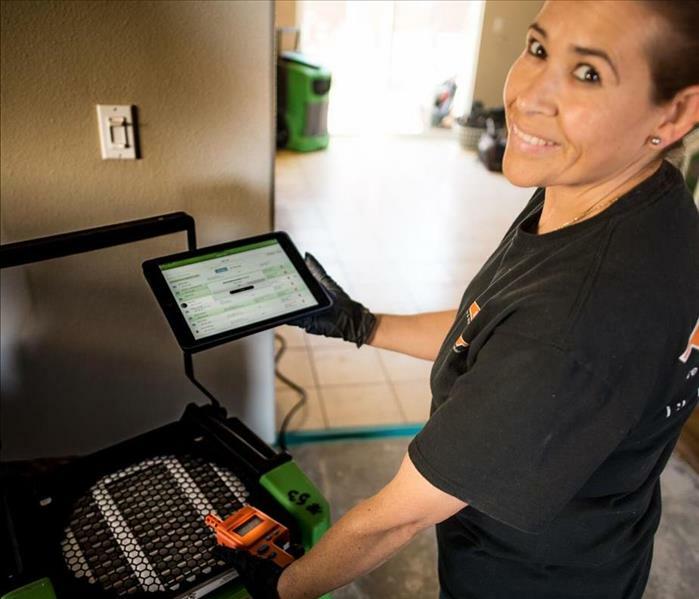 SERVPRO works hard to get things done as quickly as possible. This store was shut down for only a few weeks which seems like a long time but there was a lot to do! Pack out inventory, water mitigation, city permitting, rebuild and move back in. This empty apartment had a back water backup overflow the toilet and was unnoticed for weeks. The smell and microbial growth was as bad as it gets! This property manager called SERVPRO of Santa Barbara as soon as it was discovered. SERVPRO use only EPA registered antimicrobials with have certified kill lists and can be counted on to do the job. Once the area was sanitized SERVPRO removed all of the nonstructural building materials and sanitized again before drying and detail cleaning the structure. Often it is tempting for business owners to start work immediately after a devastating fire like the one in the photo above. Once the fire is out the first thing is to evaluate the structure integrity and if need shore up any weak or dangerous areas and then secure the property. All fires should be environmentally tested for lead and asbestos before any work begins. Once test results are available a scope of work can be made for adjuster and city/county approval and permits pulled once planning, adjuster and owner has approved the work. Although SERVPRO trys to save as much as possible trying to save what is obviously not salvageable ble can also be a wast of money and time. 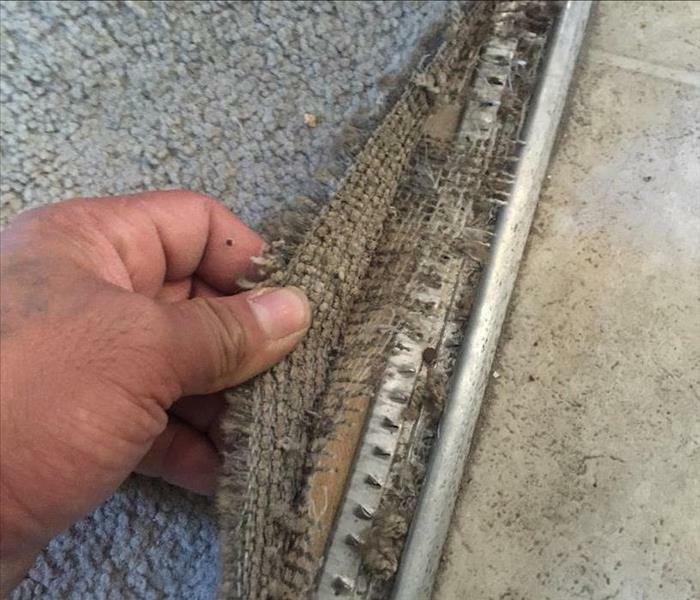 Older carpet that has fallen apart should be extracted and thrown out. Most insurance companies want a one foot by one foot sample saved for evaluating the total loss carpet’s value for replacement. This Montecito home bedroom flooded from a recent storm causing mold growth. SERVPRO quickly contained the area off, set up negative air machines and removed the water damaged nonstructural building materials. Once the structure was dry SERVPRO cleaned up the area and got it ready for third party clearance testing so it could be put back together. It is important to check gutters and drains before winter storms come. They are often plugged up with debris such, as leaves from fall. A plugged drain caused flood damage to this office in Goleta. SERVPRO quickly extracted the standing water and set up drying equipment. Most molds like little air movement, low light / dark, something organic to eat and moisture. It was the perfect place to grow behind this dresser after the wall got wet. 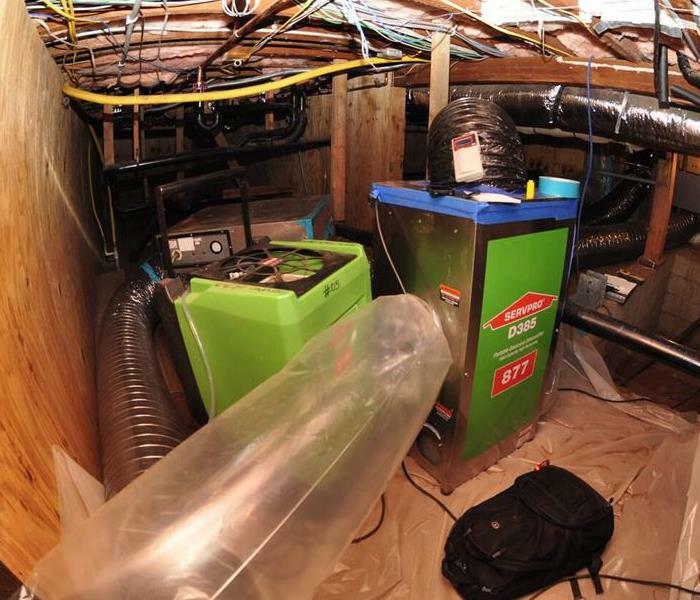 SERVPRO immediately contained the mold damaged area and started the remediation work. SERVPRO treats all mold and bacteria with EPA approved antimicrobial as a first step to remediation. After treatment and critical barriers or containment is setup engineered air movement is setup next. Once these things are in place work can safely start. SERVPRO will test clean areas to see how to proceed overall. This smoke damaged ceiling in Summerland was cleaned without the need for painting. This is know as clean to clean meaning no other work will be needed after cleaning is complete. This Santa Barbara home flooded during our last winter storms this year. SERVPRO removed wet carpet in the bed room and sanitized as needed. Once everything was disinfected SERVPRO set up drying equipment as needed. After heavy rains SERVPRO used a IR (infrared) camera to help find all the damage. IR cameras make quick work of finding water damaged areas. Although the IR camera does not see wet or dry water is often a different temperature and evaporation creates a cooling effect. 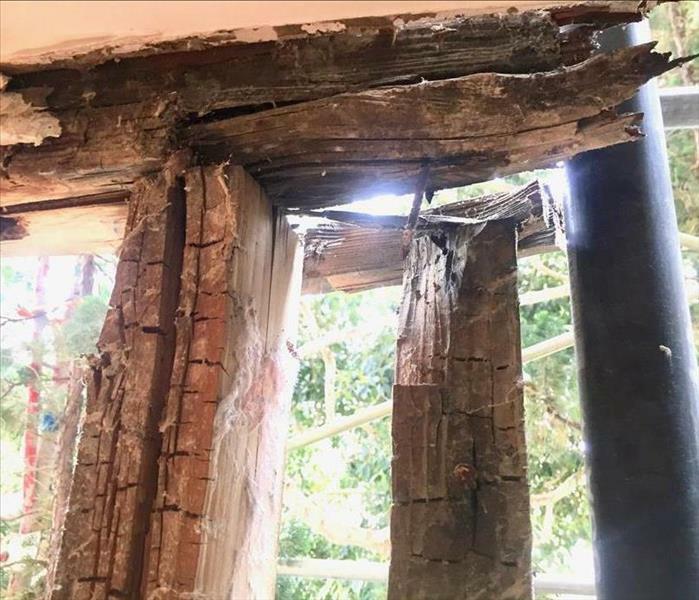 This home in Montecito had water intrusions from a outside deck above living space. You should inspect decks over living spaces every few years and have a relationship with a good contractor to make sure it stays sealed. Unfortunately SERVPRO see failed decks too often. 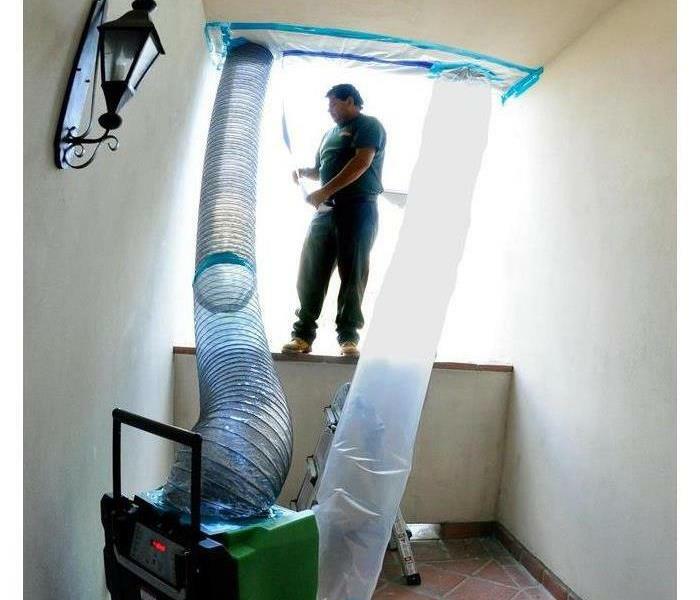 SERVPRO of Santa Barbara can work with your contractor to remedy these types of issues that can cause serous damage. 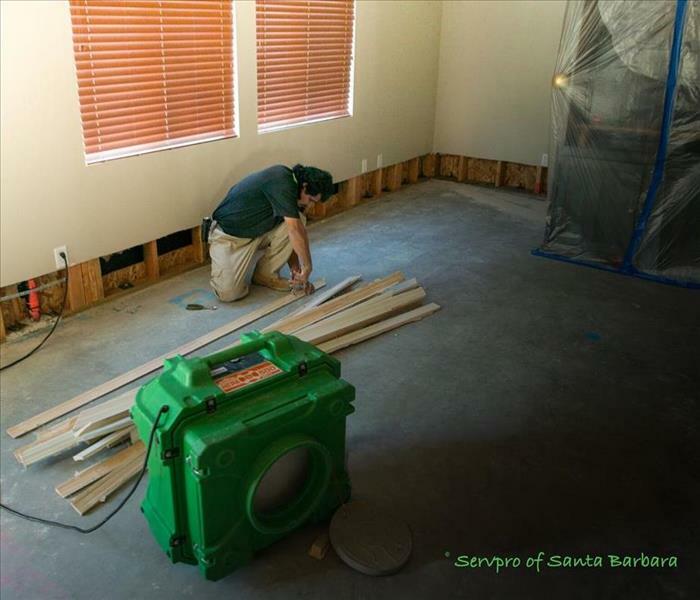 SERVPRO of Santa Barbara has the ability to respond to any size storm call. with over 1700 offices in the United States we can help. This Santa Ynez building suffered from water damage during our last winter storm. Car fires can be tough to clean up. Car fires are burned plastic, fuel and oils but, with elbow grease and the right chemicals This carport was cleaned, rebuilt and painted to make it "Like it never even happened. The mold is up and ready for testing in this Santa Barbara apartment. SERVPRO of Santa Barbara works with many property managers in the Santa Barbara area. They know we come up with quick solutions to problems and heave right equipment to get it done! This apartment master bedroom is mold free and ready for clearance testing just after a few days of work! 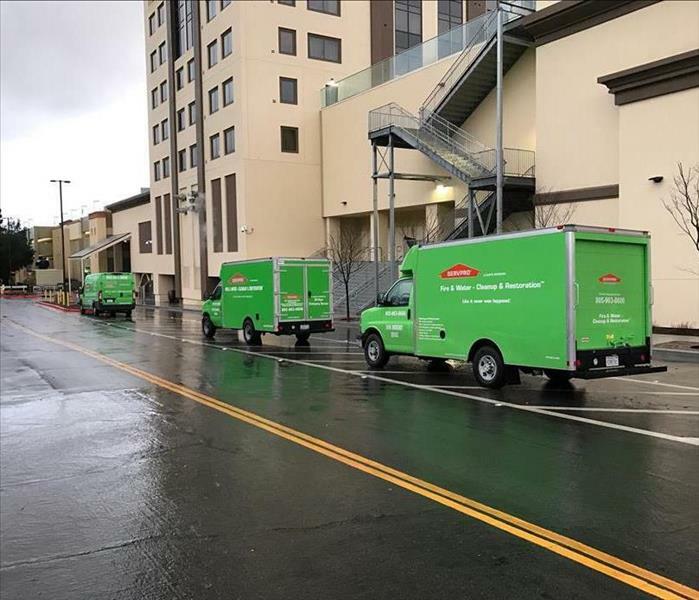 Keeping this Goleta business up and running during mold cleanup was SERVPRO of Santa Barbara's priority. It is important to be creative and solve the bigger problems at hand. In this case SERVPRO of Santa Barbara was able to keep this control room up and running by making a confined work space under the counter. Only about two feet of linear lower drywall needed to be removed. SERVPRO made a small containment sealed to the counter top and creatively set up a small negative air machine. This saved time and money and kept things running for this company while still allowing access to this room and it’s controls. A little coil ducting and lay flat ducting can go a long ways to getting the hard to reach area dry. This Carpentaria Commercail building had a hard to reach water damage that was dried from the out side in. Saving the property manager loss of use issues. smoke detectors kept this fire from getting completely out of control! The family in this Buellton home made it to safety in the middle of the night when the stove top hood vent caught on fire in their kitchen. The oldest boy of the family was able to use fire extinguisher to put the fire out.Relatively small amount of smoke and soot damage and no one was injured. Please test those smoke detectors and keep fire extinguishers near by. Sometimes we think water damage to a building can just be a inconvenience or only a issue for some people with allergies or compromised immune system. A water damage left alone or not undetected can cause major structural damage and can make a building unsafe. This Commercail building needed the exterior wall rebuild. IR (infrared) cameras can make fast work of finding water damaged areas. 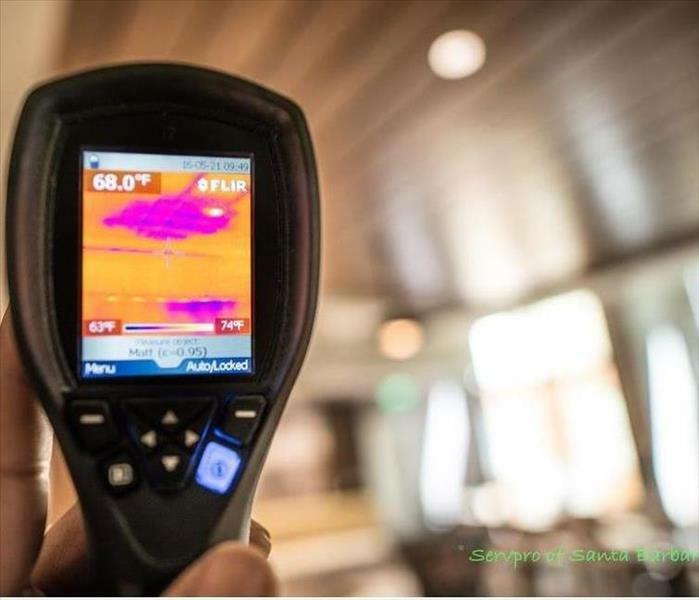 Although IR cameras only see temperature differences it can make fast work of finding water damage in a large area quickly. A few things make this happen. The water is often a different temperature then the material it has soaked into and evaporation causes a cooling effect. Only part of this Santa Ynez restaurant was only shut down for a short time. SERVPRO made it "Like it never even happened." 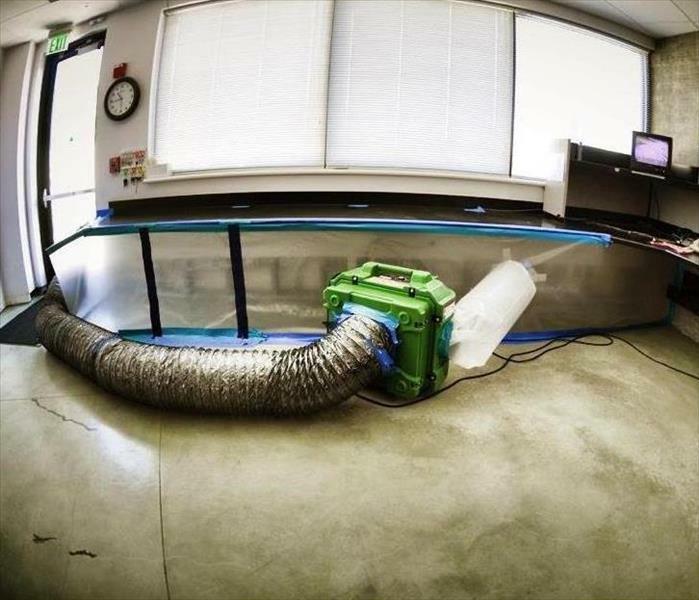 This commercial office building in Goleta had a flood that caused some bad odors. 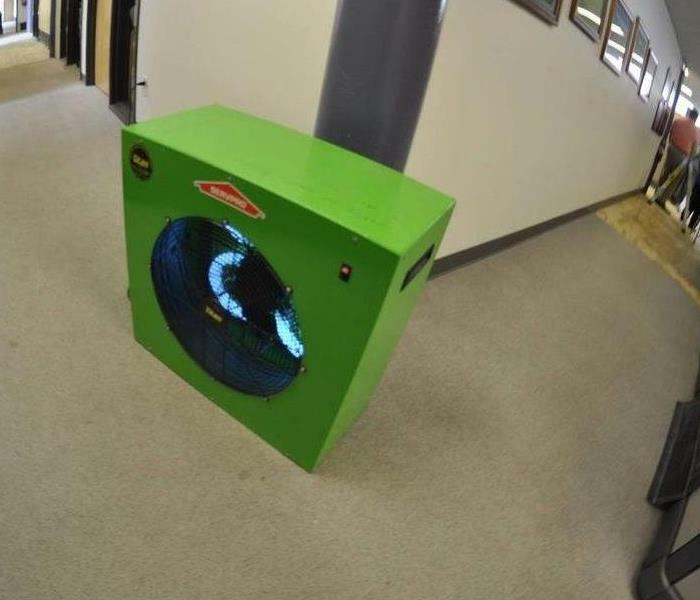 SERVPRO was able to use a Hydroxyl Generator to remove odor and help purify the area. They can be safely used around people, pets and plants a are minimally disruptive. The Hydroxyl Generators allowed parts of the office area to stay productive during the cleanup. Salute taking the time to update the SERVPRO DryBook Mobile app on the iPad for this water loss in Ventura. Our paperless systems allow real time documentation for everyone that needs to know and they can see every step of the drying process. Javier with SERVPRO of Santa Barbara taking the time to save baseboard in this Buellton home for reuse. carefully removing the baseboard , pulling nails and marking the back so when it time for repairs it goes back on the same wall / place. this saves material costs and time (getting the material, cutting and less painting). 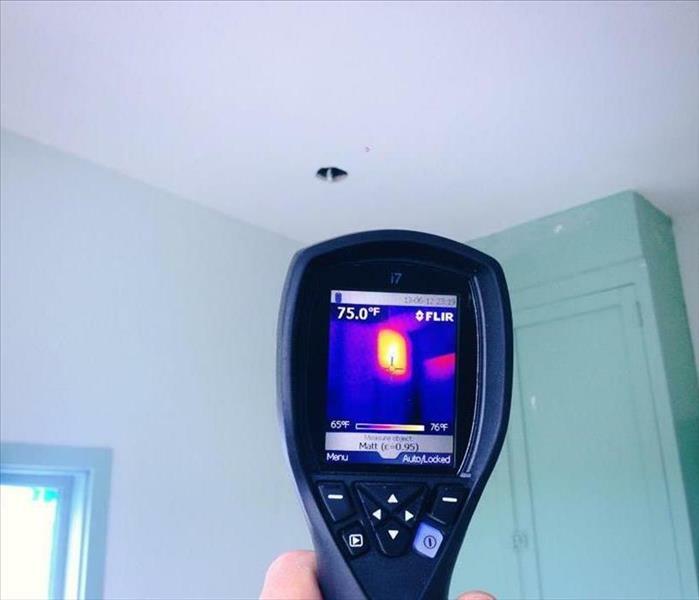 infrared cameras help find water damage! This large hotel in Solvang Ca had a water leak. But, where did it go and where did it come from? 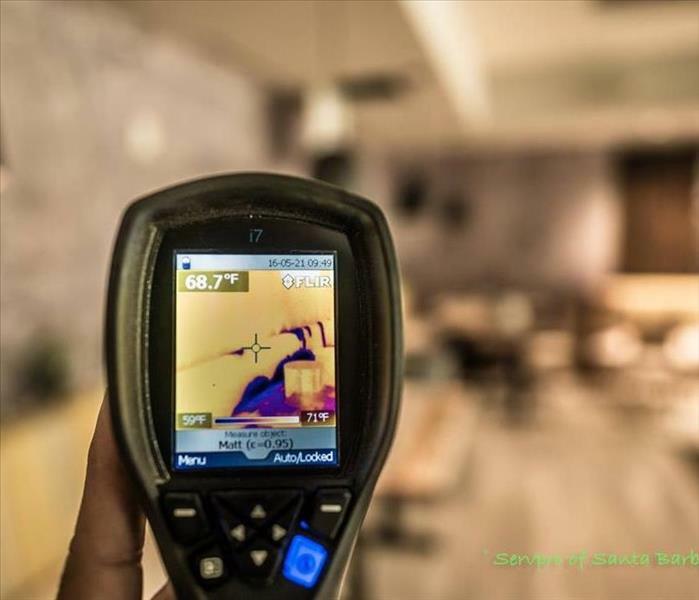 IR cameras our one of our favorite tools at SERVPRO of Santa Barbara. Call us out and we will find it! Impossible to dry? Not for SERVPRO of Santa Barbara! 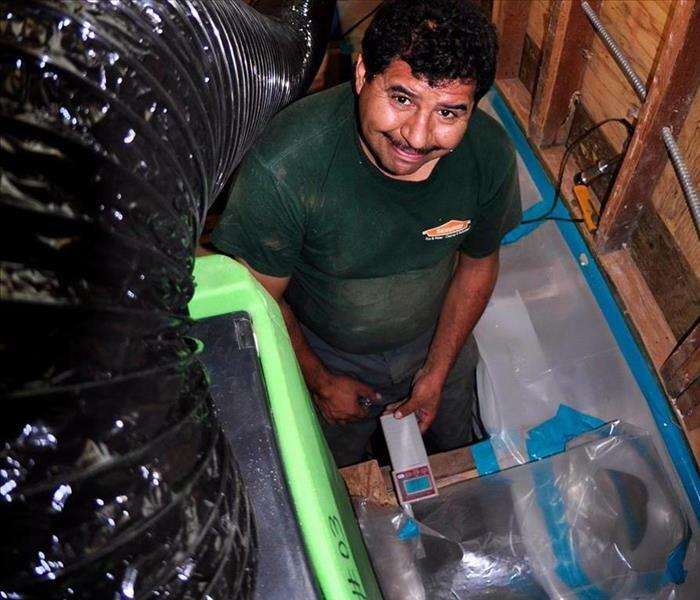 Javier has worked with SERVPRO of Santa Barbara for 8 years and he knows a trick or two on how to get that water soaked beam dry on this home in Santa Ynez! 1-4-8 on time every time ! 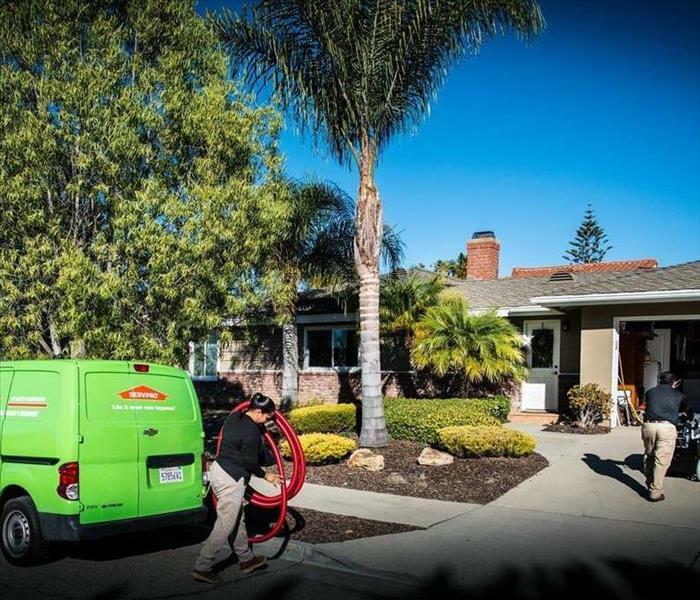 SERVPRO of Santa Barbara often exceeds our time stamp promise! 1 hour call back, show up in 4 hours and update loss information in 8 hours. Arriving for emergency service at this Lompoc home in a little over a hour. Bees generate heat and the IR camera found the hive and a local bee keeper got the queen and safely moved the hive with minimal damage to the home. Storm damage to this Santa Barbara home occurred during the night when high winds that accompanied the storm broke a window in this hallway. SERVPRO was called for emergency board up during the storm to prevent additional water damage. We immediately cranked up the water removal equipment also to extract water that had already entered the home. When the rain subsided, we set up air movers and dehumidifiers to complete the drying job. The homeowners were thankful that we had been able to help them avert any further disaster. The home was back to normal by the end of the day. If storm damage threatens your home or business, call SERVPRO of Santa Barbara 24/7 at (805) 963-0606. 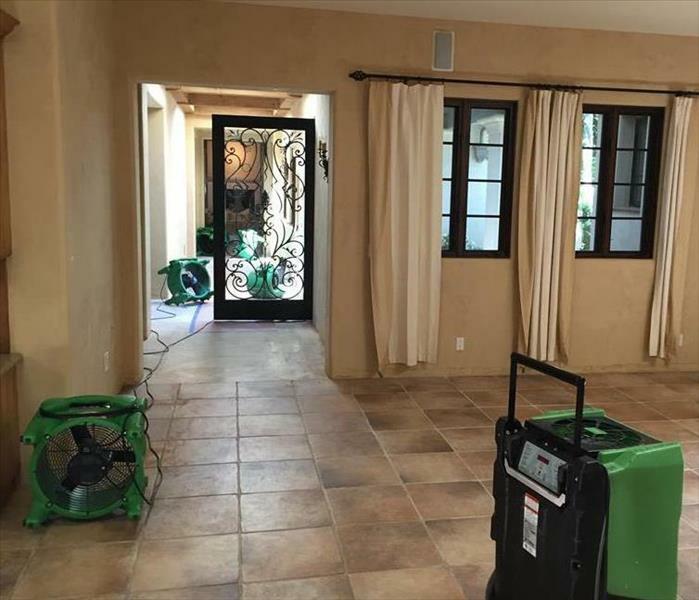 Water damage at this Carpinteria residence required the use of a portable desiccant dehumidifier as shown. Water damage cleanup often requires dehumidification to aid the drying process. We found a way to make the equipment fit for this project. You can count on the latest equipment and procedures being used to facilitate your water repair. If water has caused issues at your home or business, call SERVPRO of Santa Barbara 24/7 at (805) 963-0606. Fire damage at Goleta home required content cleaning. We packed out the contents and transported them to our facility for cleaning. 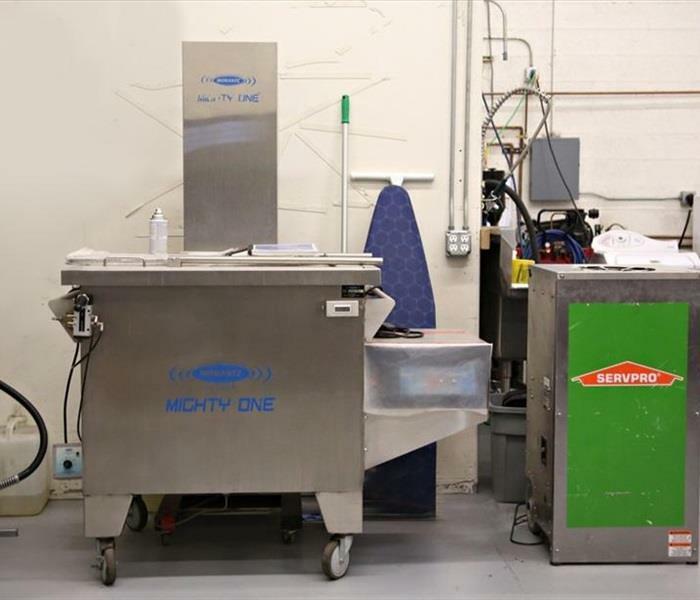 We used a commercial ultrasonic cleaner to restore contents affected by water, smoke, and fire damage. This specialized equipment is more efficient and thorough than other methods of cleaning. If fire damage and smoke leave their mark on the contents of your property after the fire has been extinguished, call SERVPRO of Santa Barbara 24/7 at (805) 963-0606. We have the advanced equipment and methods to restore your belongings. Flood damage in Santa Barbara often leaves carpeting soaked and soiled. 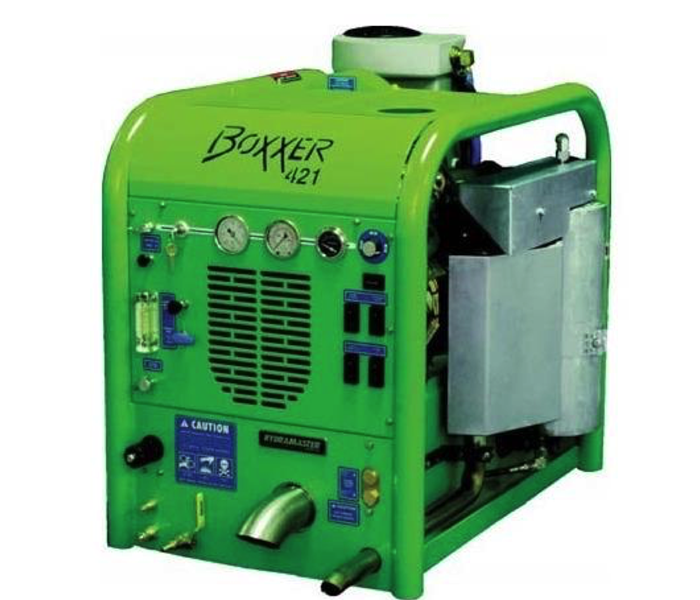 SERVPRO trucks are commonly equipped with extraction units as the one pictured here. These commercial extractors are designed to remove the maximum amount of floodwater damage in the shortest time possible. If you need help to clean up a flood, call the professionals at SERVPRO of Santa Barbara 24/7 at (805) 963-0606. We provide 24-hour emergency service. Mold damage remediation up close in Lompoc. 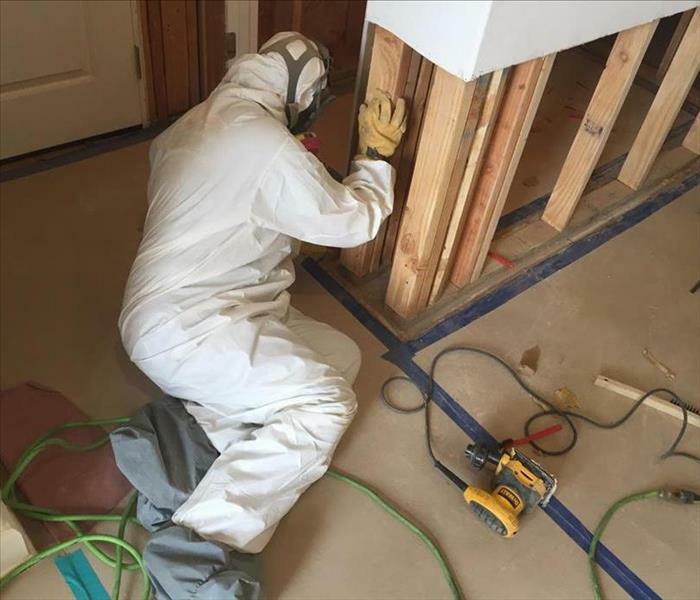 The end stages of mold removal being performed in this photo clearly illustrates the effectiveness of SERVPRO's methods and cleaning compounds. Mold spores present several potential health hazards making it imperative to remove mold infestations as quickly as possible. If you discover mold damage at your home or place of business, call SERVPRO of Santa Barbara at (805) 963-0606.